It can be a dangerous thing, travelling to paradise. Those turquoise lagoons and snow-white beaches and lushly foliaged hills often conceal a more sinister side, a Mr Hyde to the brochures' bright-and-shiny Dr Jekyll. So it was in the South Pacific island of Samoa this week, when Cyclone Amos skirted by. It should have come as no surprise to me that this was a vulnerable place, for Samoa, comprising the tiniest, most insubstantial atoll, seems to have been placed in some act of randomness in the gaping centre of the vast Pacific Ocean. It's as though shards of earth dislodged by the clashing of tectonic plates have spun out of control, landed in this oceanic morass and taken root. Before news of the impending weather event reached us on Friday night, my husband and I had been enjoying the pleasures of Samoa — its warm, unendingly hospitable people, its soporific quality (never had we slept so much, so easily), its many attractions, such as the one-time home of the very creator of Dr Jekyll and Mr Hyde, Robert Louis Stevenson, who had come to this paradise in the hope that it would cure him of tuberculosis (sadly, it didn't; he is buried on a hill beside his island home). We took little notice, perhaps because we'd quickly settled into the no-worries rhythm of island life; perhaps because the locals had seemed so nonplussed by Amos' approach. But change came swiftly. Next morning we were told the cyclone was headed for Samoa's main island, Upolu, where we were staying. The capital city, Apia, was bracing for floods; buildings were being sandbagged; New Zealand's High Commission had closed; all flights in and out had been cancelled. 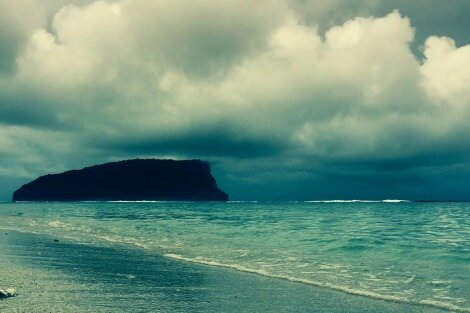 Still, we felt calm, for there wasn't a breath of wind in the sky, and the rain — falling in fat cold drops that morning when we'd gone for a swim in So Tua Trench — had cleared. There was even a weak shaft of sunlight poking through the clouds. Surely the cyclone would change its course. "In the space of one day we'd gone from being happily marooned on a romantic tropical island to being trapped on a tiny fleck of land upon which a cyclone was bearing down." But that night the storm was upgraded to the highest category, a five. The Australian High Commission rang our resort to check whether any Australians were staying there. The resort owner and his staff stacked tables and chairs in the dining pavilion, lashed together bifold doors, leaving a space for the wind to pass through so the roof wouldn't blow off. If things got too bad, the owner siad, we'd evacuate to one of the churches on higher ground. Preferably one of those built by the Latter Day Saints, he added with a smile, since they were most solid. Before our eyes, Dr Jekyll was transforming into Mr Hyde. In the space of one day we'd gone from being happily marooned on a romantic tropical island to being inescapably trapped on a tiny fleck of land upon which a cyclone was bearing down. But most distressingly, we'd left at home our children, two young adults and one teenager, all three too young to be orphaned. The cyclone arrived at 2.30am on Sunday morning. The wind blew like a freight train, loud and relentless. We lay on the bed, fully dressed, rigid with terror. Our passports and phones and wallets were in a bag at the door, ready to be grabbed on our way out. At the height of it, I stood up in the dark, opened the curtains and looked outside. Moonlight had somehow filtered through those angry clouds; though their leaves strained painfully in the wind, the palm trees stood tall; the furniture we'd stacked on the deck didn't budge. I knew then we'd be safe. Morning came, still and silent. We looked at each other hopefully: the storm must have passed. And so it it had: downgraded to a category three, it had had veered off towards American Samoa before dawn. It had caused flooding and extensive road damage on the island's north coast, but had only licked the south-east coast, where we were staying. No-one had been killed. We felt a deep sense of relief and gratitude. Mr Hyde was gone and Dr Jekyll was back in his place by early evening as we drove across the island for our late night flight. Though the airport was busy — flights to Sydney had not yet resumed and so passengers were jamming onto planes bound for Auckland instead — there was none of the panic one associates with a near-disaster. Drivers hugged their foreign passengers goodbye; families gathered in big, brightly-dressed groups to see off their loved ones; and a fresh load of visitors stepped off a just-landed plane and into this beautiful, embracing, mercurial paradise called Samoa. I was a volunteer teacher trainer in Samoa and lived with my family there for a couple of years. There is a very strong sense of vulnerability in any cyclone. However, it creates an incorrect perception to suggest: "this was a vulnerable place, for Samoa, comprising the tiniest, most insubstantial atoll, seems to have been placed in some act of randomness in the gaping centre of the vast Pacific Ocean". An atoll is a ring-shaped coral reef, or a string of closely spaced small coral islands, enclosing or nearly enclosing a shallow lagoon. Samoa is almost totally formed from a volcanic eruption with some very high peaks (1,858 metres) at the centre of the two large islands Savai'i and Upolu. If you are looking for "a tiny fleck of land" that is an atoll, with the highest point around 4 metres above sea level, Kiribati is asking Palms (www.palms.org.au) to recruit, prepare and send teachers, health workers and managers to assist build the skills of individuals and the capacity of organisations seeking to become sustainable and self-reliant in the face of them needing to migrate due to climate change. In return the I-Kiribati people will demonstrate how to manage vulnerability. Roger, I should have used the word 'archipelago' instead of 'atoll'. Nonetheless, I stand by my perception of Samoa (volcanic peaks and all) as a vulnerable place to be during a cyclone. Recent category 5 cyclones in the Pacific are a sign of the times, with the climate changing due to our greenhouse gas emissions. As we're on track for a 3 to 4 degree C rise in temperature since pre-industrial times, and the world is far too slow to act on reducing carbon emissions, Who are you voting for at the next election? I hope it's not a party/parties that receive huge donations from the big polluters, and are still approving new coal mines.